Dutch builder Stephan Niks goes under the skin of a minifigure with his Lego Ideas build – Anatomini. A supersized minifigure (43.2cm!) showing what could be underneath the ABS. 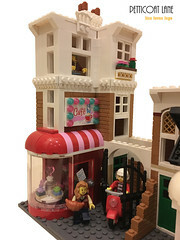 I just finished my 6th LEGO Ideas idea and was thinking out loud: What shall I make for LEGO Ideas now? Taro, my 10 year old son said: A skeleton, because he had seen one at school that day. And I thought: strange idea and challenging. So I gave it a try and indeed it was hard to do, so I stopped and did another thing for LEGO Ideas. But the skeleton was still in in the back of my mind. A year later I reanimated the skeleton and this time it came alive. 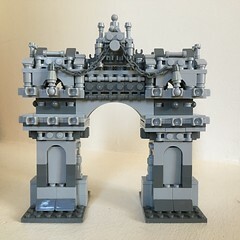 I created a friendly version made of Technic bricks because Technic bricks are strong and structural like a real skeleton is. I learned my lessons on Ideas, so I checked LEGO Ideas and the internet for LEGO skeletons. There were some, but no funny, friendly ones. I also came across with images of American artist: Jason Freeny who makes anatomic sculptures of comic figures, like Bugs Bunny, Super Mario and even the LEGO minifigure. During the design process I spoke my doctor about the skeleton. He pointed me on the educational value of the project for both teachers and doctors. So I added all the organs and Anatomini (a contraction of anatomy and minifigure) was born. The question remains: is it a human skeleton or a Minifig skeleton? I always looked at Anatomini like there were 4 projects to be done in the order: skeleton, shell, base and organs. Most parts of the inner and outer body have been designed more than 10 times. But I never felt like it was difficult, it is part of the design process to get the best you can. Once the idea came up to make a minifigure shell I had to redesign the whole skeleton to fit it into the shell – that was sometimes frustrating. The form and structure of the shell was always leading (read sacred) in this process. 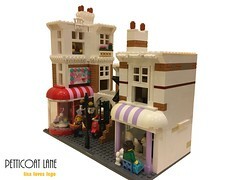 The whole design was done in LDD (LEGO Digital designer) and took approx. 200 hours spread over 2 months. The visuals were done in 3D Studio MAX and took 30 hours. Later we did Virtual Reality in Unity. Not at all! Even some doctors who commented on the project or saw it at an exhibition asked me that question. Which I take for a compliment. I am an engineer that makes visualizations of airports, harbors and shipyards. I like big stuff and small stuff as well. I have a broad interest in all aspects of science and technique from solar systems to engines to molecules. The detail that Stephan has put in to Anatomini is amazing – check out the sight and hearing organs! One of my earlier LEGO Ideas projects was an ABS molecule. I did a lot of research on chemistry. I was amazed by the calculations I made, and even made a 10 minute animation on the subject. I must admit that with only 54 supports it is wiser to do some research on what people want on LEGO Ideas. Nevertheless it was a fun project. In my profession I use 3D software on a daily basis, and for my LEGO hobby I model all my ideas 100% in LEGO Digital Designer. Only sometimes I try the strength and gravity with real bricks. I use quite a lot of render engines – PovRay, 3D Studio MAX MentalRay and Lumion. Which all have their own signature. I render pics but also a lot of animation (up to 10 minutes per model). For Anatomini I did not render animation yet, my colleague and I went even further and put Anatomini in Virtual Reality. 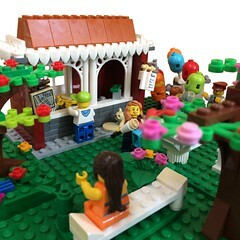 It is the first VR on LEGO Ideas and one of the first LEGO VR models worldwide. In the first 10 days Anatomini got over 1000 supports and a lot of comments on its fun and educational value. From that moment I realized that 10K could be on the horizon. The way to 10K is far from easy, but so much fun. Friends help me to market Anatomini while I do a lot of things in the background like building the real thing, producing images, animations and VR. On the foreground I do interviews, set up contacts and attend exhibitions. Anatomini is a busy, learning and rewarding once in a lifetime experience! Let’s go for 10K! Not only is the concept of Anatomini really good, it has also been interpreted really well. As well as this, the artwork (photos, video, digital artwork) of Anatomini are awesome – I’d totally recommend that you take a few minutes and have a look. I got my first LEGO when I was 4 years old and was immediately hooked. At primary school I was bored so my teacher bought 2 sets of LEGO and the problem was solved. 42 years later this inspired me to set up a LEGO class in my children’s school in the near future. At the age of seven, there suddenly was LEGO Technic – I couldn’t believe what I saw. I tried to collect the sets with the most valuable parts needed for my inventions. Meanwhile I was also interested in ships and LEGO trains. At 14 it was time for the almost inevitable dark age. Then at 33 my wife gave me a Technic racecar as a birthday present and reignited a hobby. I started collecting Technic for a while but switched to Modulars, (custom) trains, Winter Village and a bit of Architecture. I also design my own wagons and trains in LDD and build some with real bricks. Four years ago I discovered LEGO Ideas and soon after I started to show my Ideas there. LEGO Ideas became more serious and at this moment it takes all of my LEGO time. 7 Year Old Lands Work Experience Gig at Legoland! Hi Lisa, Thanks for the great post on Anatomini. You did a great job. I will spread it via Social media. Good luck with your fun blog. Regards, Stephan.